In this lesson, we will learn how to find the volume of the solid of revolution using the washer method around a horizontal line. Find the volume of the solid obtained by rotating the region bounded by the curve 𝑦 = 𝑥  and the lines 𝑦 = 1 and 𝑥 = 2 about the line 𝑦 = − 1 . Determine the volume of the solid generated by rotating the region bounded by the curve 𝑦 = 7 𝑥 2 and the line 𝑦 = 7 𝑥 a complete revolution about the 𝑥 -axis. Consider the region bounded by the curves 𝑦 = 𝑥 3 and 𝑦 = 𝑥 , for 𝑥 ≥ 0 . Find the volume of the solid obtained by rotating this region about the 𝑥 -axis. Find the volume of the solid obtained by rotating the region bounded by the curve 𝑦 = 6 − 𝑥  and the line 𝑦 = 5 about the 𝑥 -axis. Find the volume of the solid generated by turning the region bounded by the curve 𝑦 = 𝑥 + 2 2 , the 𝑥 -axis, and the two lines 𝑥 = − 2 and 𝑥 = 1 through a complete revolution about the 𝑥 -axis. 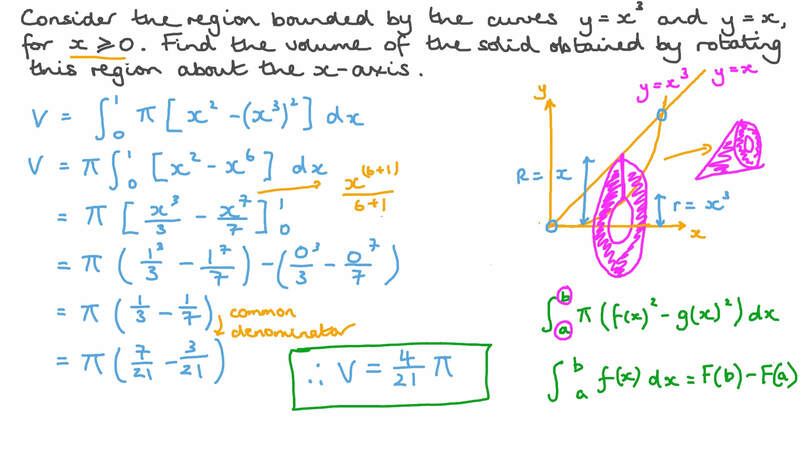 Find the volume of the solid generated by rotating the region bounded by the curve 𝑦 = − 𝑥 + 2 𝑥 2 and the 𝑥 -axis a complete revolution about the 𝑥 -axis. Find the volume of the solid generated by turning the region bounded by the curves 𝑦 = 4 √ 𝑥 , 𝑦 = − 8 , and 𝑥 = 5 a complete revolution about the 𝑥 -axis. Find the volume of the solid generated by turning the region bounded by the curves 𝑦 = 1 8 𝑥 , 𝑦 = − 4 , 𝑦 = − 6 , and the 𝑦 -axis through a complete revolution about the 𝑥 -axis. Calculate the volume of a solid generated by rotating the region bounded by the curve 𝑦 = 4 5 𝑥 and straight lines 𝑥 = 2 , 𝑥 = 8 , and 𝑦 = 0 a complete revolution about the 𝑥 -axis. Consider the region between the curves 𝑦 = 5 𝑥 2 and 𝑥 + 𝑦 = 2 2 2 , for 𝑦 ≥ 0 . Find the volume of the solid of revolution obtained by rotating this region about the 𝑥 -axis, giving your answer to two decimal places. Find the volume of the solid obtained by rotating the region bounded by the curves 𝑦 = 4 + 𝑥 s e c and 𝑦 = 6 about 𝑦 = 4 where 𝑥 ∈  − 𝜋 2 , 𝜋 2  . Give your answer to two decimal places. Consider the region bounded by the curve 𝑦 = 3 4 𝑥 c o s 2 and the lines 𝑦 = 0 , 𝑥 = − 𝜋 8 , and 𝑥 = 𝜋 8 . 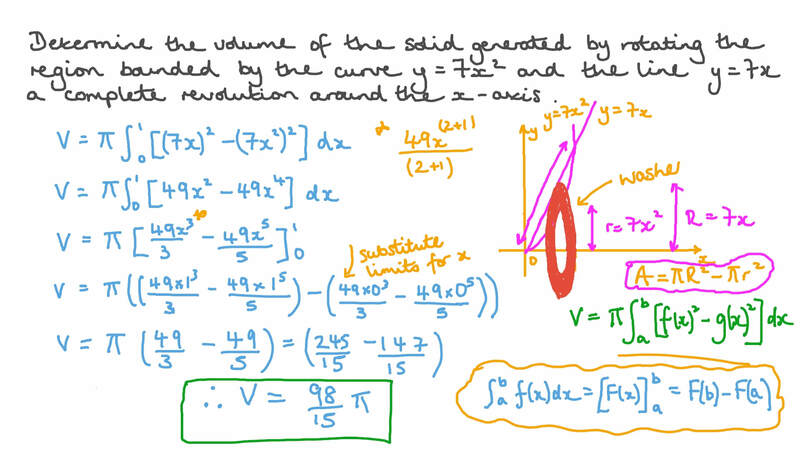 Set up an integral for the volume of the solid obtained by rotating that region about 𝑦 = 4 . Set up an integral for the volume of the solid obtained by rotating the region bounded by the curve 𝑦 = 𝑒 − 𝑥 2 and the lines 𝑦 = 0 , 𝑥 = − 5 , and 𝑥 = 5 about 𝑦 = − 5 . Find the volume of the solid obtained by rotating the region bounded by the curves 𝑦 = 𝑥 s i n , 𝑦 = 𝑥 c o s , 𝑥 = 𝜋 6 , and 𝑥 = 𝜋 4 about 𝑦 = − 1 . Give your answer to two decimal places.